Making bread, it seems such a satisfying thing to do but something about the yeast and the kneading has always made it seem a little unappealing to me, not to mention time-consuming, so bread making is always something on my mental “to do” list. Well I was lucky enough to get a copy of 5 Minute Bread, by Jeff Hertzberg and Zoë Francois, to try. This book is a UK kitchen friendly version of the bestselling Artisan Bread (in 5 minutes) from the US . The book is nicely presented and easy to read, in fact on reading it seems a little too easy! No kneading is required, I repeat, no kneading! No machines are required! This was sounding good! The 5 minutes is the preparation and does not include the baking which obviously will take more than 5 minutes! (just in case you were wondering!) You make enough dough in one go for up to 4 loaves and this dough can be stored in the fridge for up to 2 weeks you just pull off a chunk of it and bake! The title 5 minute bread seemed a little ambitious for me but I was up for the challenge. I would recommend reading the 1st few pages of the book to become familiar with the 5 minute method and to make sure you have all you need. All you really need is a large container with a lid (not tight-fitting ) and the book says to use a pizza peel to transfer the bread onto the baking stone but I don’t have one so I used a flat cookie sheet. I will save you a little time, I looked all over for “unbleached” flour and could not find it in any of the major supermarkets (I went to them all!). After some investigating it seems that it is not a legal process to bleach flour in the UK so all flour here is sold unbleached. I made the first recipe in the book, called “The Master Recipe”. Makes 4 450g/1lb loaves. The recipe is easily doubled or halved. 1. Warm the water slightly: It should feel just a little warmer than body temperature, about 38°C. Warm water will rise the dough to the right point for storage in about 2 hours. You can use cold tap water and get an identical final result; then the first rising will take 3 or even 4 hours. That won’t be too great a difference, as you will only be doing this once per stored batch. 2. Add yeast and salt to the water in a 5 litre/ 8 3/4pint bowl or, preferably, in a resealable, lidded (not airtight) plastic food container or bucket. Don’t worry about getting it all to dissolve. 3. Mix in the flour—kneading is unnecessary. Add all of the flour at once, mix with a wooden spoon, a high-capacity food processor (3.5 litres/6 pints or larger) fitted with the dough attachment, or a heavy-duty stand mixer fitted with the dough hook until the mixture is uniform.If you’re hand-mixing and it becomes too difficult to incorporate all the flour with the spoon, you can reach into your mixing vessel with very wet hands and press the mixture together. Don’t knead. It isn’t necessary. You’re finished when everything is uniformly moist, without dry patches. This step is done in a matter of minutes, and will yield a dough that is wet and loose enough to conform to the shape of its container. 4. Allow to rise Cover with a lid (not airtight) that fits well to the container you’re using. Allow the mixture to rise at room temperature until it begins to collapse (or at least flattens on the top), approximately 2 hours, depending on the room’s temperature and the initial water temperature. Longer rising times, up to about 5 hours, will not harm the result. You can use a portion of the dough any time after this period. Fully refrigerated wet dough is less sticky and is easier to work with than dough at room temperature. So, the first time you try our method, it’s best to refrigerate the dough overnight (or at least 3 hours), before shaping a loaf. Relax! You do not need to monitor doubling or tripling of volume as traditional recipes. 5. 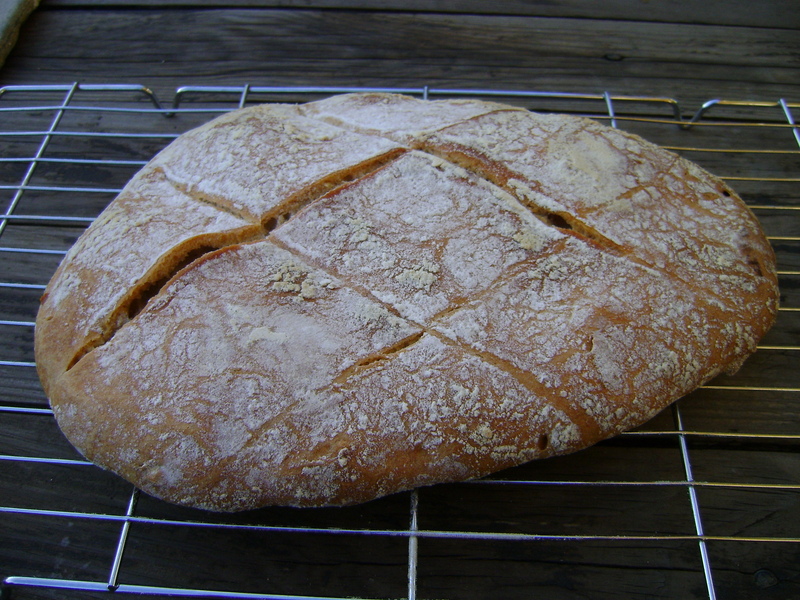 The gluten cloak: don’t knead, just “cloak” and shape a loaf in 30 to 60 seconds. First, prepare a pizza peel (I used a flat cookie sheet) by sprinkling it liberally with cornmeal (or whatever your recipe calls for) to prevent your loaf from sticking to it when you slide it into the oven. 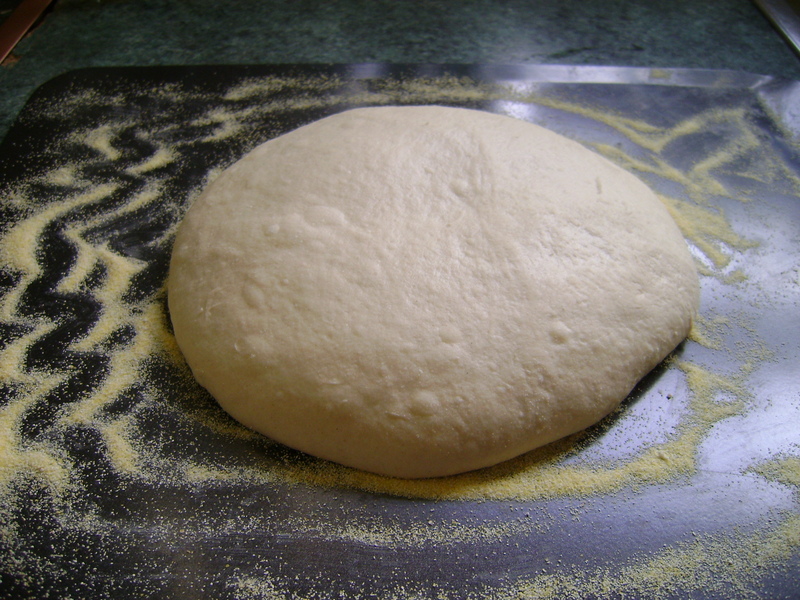 Sprinkle the surface of your refrigerated dough with flour. Pull up and cut off a 1-pound (grapefruit-size) piece of dough, using a serrated knife. Hold the mass of dough in your hands and add a little more flour as needed so it won’t stick to your hands. Gently stretch the surface of the dough around to the bottom on all four sides, rotating the ball a quarter-turn as you go. Most of the dusting flour will fall off; it’s not intended to be incorporated into the dough. 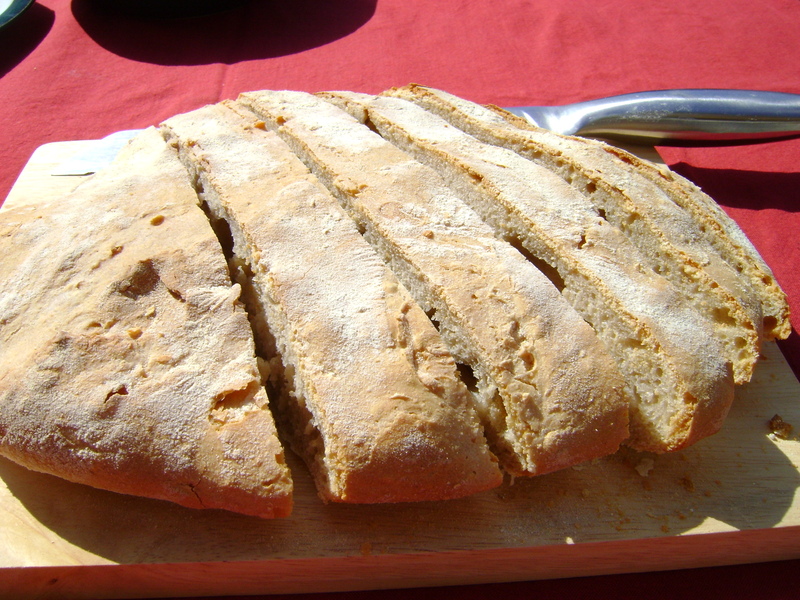 The bottom of the loaf may appear to be a collection of bunched ends, but it will flatten out and adhere during resting and baking. The correctly shaped final product will be smooth and cohesive. The entire process should take no more than 20 to 40 seconds. 6. Rest the loaf and let it rise on a pizza peel Place the shaped ball on the polenta covered pizza peel (or cookie sheet) Allow the loaf to rest for about 40 minutes (it doesn’t need to be covered during the rest period). Depending on the age of the dough, you may not see much rise during this period; more rising will occur during baking (“oven spring”). 7. Thirty minutes before baking, preheat the oven to 230°C/gas mark 8 with a baking stone placed on the middle rack, (I used my pizza stone) Place an empty grill tray for holding water on any other shelf that won’t interfere with the rising bread. 8. Dust and slash; dust the top of the loaf liberally with flour, which will allow the slashing knife to pass without sticking.Slash a 1/4-inch-deep cross, scallop or criss cross pattern into the top, using a serrated bread knife. 9. Baking with steam: After a 30-minute preheat, you’re ready to bake. With a quick forward jerking motion of the wrist, slide the loaf off the pizza peel and onto the preheated baking stone. Quickly but carefully pour about 250 ml/8fl oz of hot water from the tap into the grill tray and close the oven door to trap the steam. Bake for about 30 minutes, or until the crust is nicely browned and firm; there is little risk of drying out the interior, despite the dark crust. When you remove the loaf from the oven, it will audibly crackle, or “sing,” when initially exposed to room temperature air. Allow to cool completely, preferably on a wire cooling rack, for best flavor, texture, and slicing. The perfect crust may initially soften, but will firm up again when cooled. 10. Store the remaining dough in the refrigerator in your lidded (not airtight) container and use it over the next 14 days You’ll find that even one day’s storage improves the flavor and texture of your bread. This maturation continues over the 14-day storage period. Refrigerate unused dough in a lidded storage container (again, not airtight just crack the lid a little, or punch a small hole in the plastic lid). If you mixed your dough in this container, you’ve avoided some cleanup. Cut off and shape more loaves as you need them. We often have several types of dough storing in the refrigerator at once. The dough can also be frozen in 450 g/1 pound portions in an airtight container and defrosted overnight in the refrigerator prior to baking day. I made bread! This was my first loaf of the batch and admittedly took me longer than 5 minutes to prepare the bread. The mixing of the dough was bliss, literally just mixed it up with a wooden spoon, so easy! The “gluten cloak” I was a little clumsy with, it did take me longer than a minute as it all kept sticking to my hands but eventually I had a little ball that I was happy with. I struggled with the “dust and slash” as my knife got caught in the dough! Also I could not perfect the “quick forward jerking motion of the wrist” required to slide the loaf onto the baking stone in the oven! My loaf would not come off the cookie sheet so I half shook and half dragged it off! However despite my less than perfect technique I ended up with a loaf of bread that actually tasted great! This was my second loaf! I probably was a little more comfortable this time although still struggled to get the loaf into the oven and again the knife got stuck in the dough when slashing. My 3rd loaf of the batch was the best! I was faster and as it had been in the fridge for 2 weeks it was more sour dough tasting which was a real bonus! 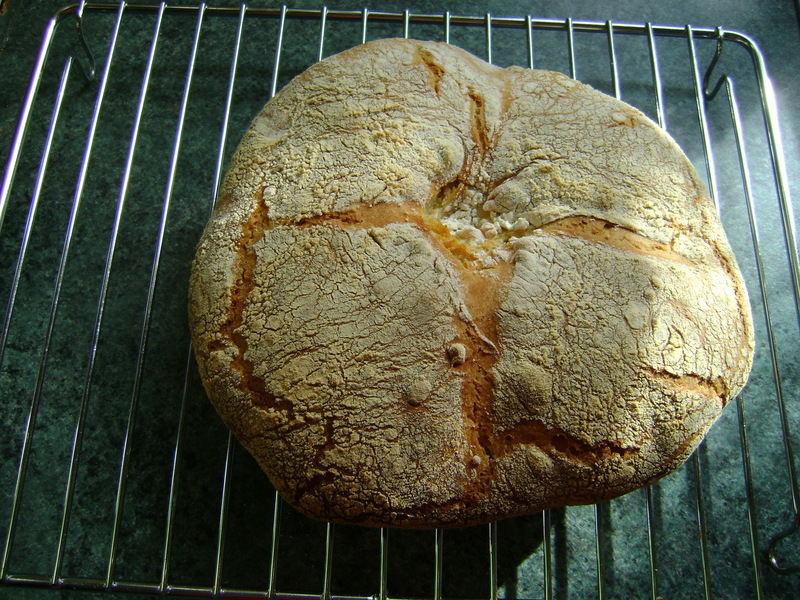 So I baked bread – miracles! My husband and I loved this bread. Really it tasted as if Id paid way too much at the local farmers market for it! It may not have been as pretty as if Id got it from the market but it tasted great, was way cheaper and I know exactly what ingredients went into it. I only made 3 loaves from my mixture but that was fine for me. Next time I make the bread I will try to use parchment rather than polenta to get the loaf into the oven. It took me longer than 5 minutes to make, I guess that time will decrease as I become more experienced. What “5 Minute Bread” did give me was confidence. Confidence to try something that Id previously thought too much effort. I will be using this book a lot in the future, as well as perfecting my 5 minute technique I want to try the light wholemeal bread, the olive bread and the bagels! I highly recommend this book! This entry was posted on April 30, 2011, 14:46 and is filed under Baking. You can follow any responses to this entry through RSS 2.0. You can leave a response, or trackback from your own site. Wow! That’s incredible! You make me want to try it but it seems a bit ambitious for me! It looks delicious tho! I’m glad it turned out good for you! I’ll save this & if I try it I will let you know how it turns out! Probably not as good as yours! Lol! Thank you, Im sure if you try it will turn out just as good for you! Its really easy! This is definitely my kind of bread recipe! I had to shake my head about the US allowing bleached flour to be sold. In fact, it is much more popular and less expensive than unbleached flour. Oh do try this bread- so easy & such a nice feeling knowing there is dough in the fridge waiting for you! Flour here does look really white so I assumed it was bleached – wow, I wonder how white bleached flour looks? This looks amazing! I am going to have to try this!! Thanks for telling me about this. I just did a bread making class with Virtuous Bread and it was fab to find out that making bread is actually really easy. I have not seen this book before so will look out for it. Am obsessed with making breads and am looking for more bread making books. Hi Jayne, Thanks for sharing your experimentation. I’ve also just bought the book and made my first loaf yesterday. I was amazed at how good it was, but it didn’t have the big holes and chewy texture I was hoping for, so I’m going to play around and see what I can do. One question for you. The metric and imperial measurements don’t quite match. Which did you use? And did you just use regular plain flour or strong flour. It would be great to get your thought as I try to create my perfect version. By the way, my dough also got stuck as I tried to get it into the oven – but somehow it still baked itself into a normal-ish shape. Hi thanks for your comment. I just copied the measurements from the book, I used the metric measurements making my dough. I also used plain white flour as in the book they said plain flour was their number one choice and suitable for most of the recipes in the book. I still get my dough stuck! I hope you do get your perfect loaf! Thanks Jayne. Hope your bred gets better & better.